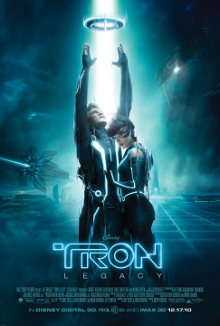 When I heard that they were making a sequel to TRON, I had mixed feelings about it. At that time I still held TRON in high regard (as yesterday’s review stated, it doesn’t age as well as I wish it did), and it was nearly three decades after it was released, and blah blah blah Hollywood doesn’t have original ideas anymore, etc. Yes, there was a potentially huge cult fanbase that would blindly embrace anything TRON-related, but could it be great or even as good as the first one? In my opinion, yes. A 2010 TRON movie would easily be on par with the 1982 version’s technical achievements, and with an elderly Jeff Bridges comfortable with his real life Zen persona being shown onscreen, well certainly the acting would be much better. The set pieces would be guaranteed to be far more epic and action-packed, and with the nostalgia factor, for me the only way it would have been disappointing is if it had no heart or story. Thankfully, it’s a decent enough tale, though not nearly as action-packed as I’m sure modern audiences would have wanted. Sam Flynn (Garrett Hedlund) ends up following in his father, Kevin Flynn’s (Jeff Bridges) digital footprints by being transported onto The Grid in much the same manner, with Sam being forced to compete in The Games for the entertainment of the masses. Turns out that Kevin’s creation, CLU (a digital Bridges), took over The Grid in order to create a perfect world, and Kevin had been living in hiding for 20 years or so. With the help of Kevin’s apprentice, Quorra (Olivia Wilde), Sam attempts to get back to the real world with his father. If you go in expecting some sort of Matrix-style movie, you don’t know much about the original TRON. It’s far more Zen than that. Legacy doesn’t really speed along at points, being much more comfortable in methodically going about its business. My biggest issue with the film is related to some of the technical effects, with the younger Kevin Flynn/CLU portrayed in such an unsettling, Uncanny Valley manner. CGI artists just haven’t gotten the human mouth down to perfection yet. I really enjoyed Legacy, to the point where I would put it above the original TRON simply because it is a more entertaining and enjoyable movie experience. The first one was a trailblazer, sure, but not nearly as fun as this one.